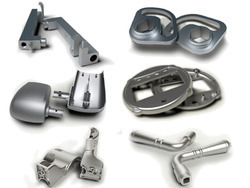 Our range of products include zinc castings. Being a client centric organization, we are involved in offering a wide range of Zinc Casting. Designed under the firm direction of experienced quality controllers, these products are acclaimed for optimum quality, robustness, rough and tough usage and corrosion resistance. These are available in various range and dimensions. Looking for Zinc Castings ?